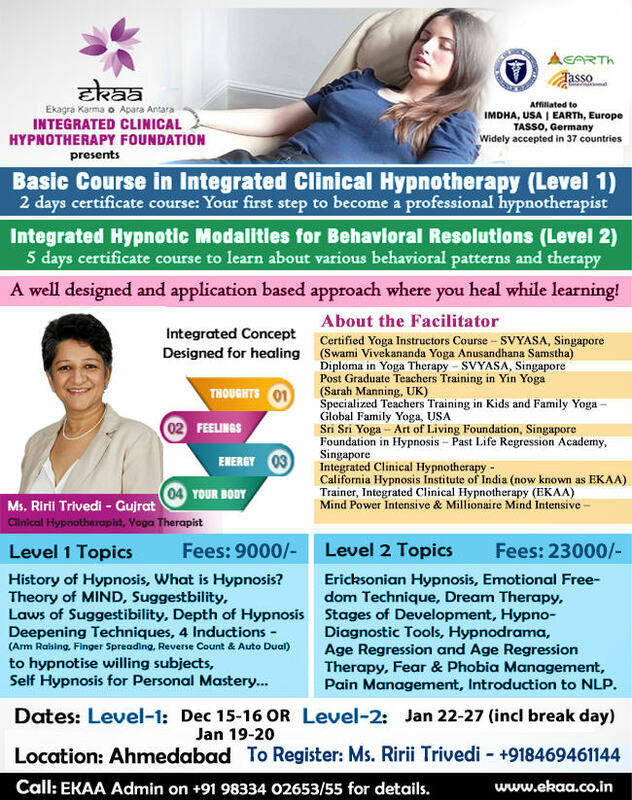 Keen to Learn Hypnotherapy ? Self Mastery through the un-peeling of behavioral and emotional layers to craft a desired life! People Who are gifted with qualities of compassion and respect towards others or are seeking some kind of completion with complete sincerity and dedication! Everyone who want to put sincere efforts to make a difference in their own LIFE and create balance for every one around! Getting rid of past painful patterns and hurtful associations which doesn’t let you grow! Learning what are the factors involved in order to influence/change the belief system of any individual, to bring about behavioral change in them. Learning Conversational Hypnosis through indirect or inferred suggestions using the techniques of Milton Erickson. Learn to deal with sudden emotional outbursts or stubborn emotional patterns which we are unable to handle, understanding the subjective unit of discomfort (SUD) and bringing them to zero level of discomfort in less than 5 minutes with the willingness of the client. Understand the language of the subconscious mind to get metaphorical messages and interpret them for you as well as your clients. learn to interpret the dream language and meanings. Acquire most helpful tools viz. Corrective therapy, Paris window and applications to get to the core of the client’s issue and bring them to resolution with different hypnotic Modules. Most profound tool to release the toxicity of the past painful memories and sorting any kind of relationship issues or skill improvement to create new realities of emotional empowerment and success, this is just amazing! Going back in time to resolve painful memories and patterns to move ahead towards peace and success is what is the objective of this session. Each participant will get to practice and experience this to heal one issue that is holding them back. This is a profound tool to heal with hypnosis, as going back in time to heal toxicity of the past is a rare chance. Many fears we experience, mostly have their origin in this life and by enlarge phobias come from our past lives! We learn to deal with them, with circle therapy, so that they never surface again, attaining inner peace. Learn to deal with any kind of pain and reduce it substantially just in 1 session with hypnosis. Learning NLP to understand how mind received inputs in the form of Linguistic patterns associated with different situations/circumstances.